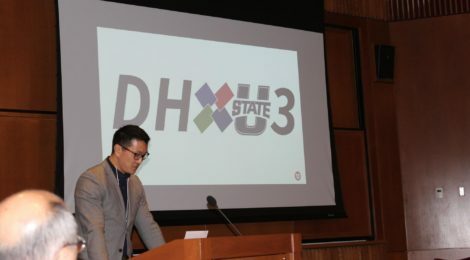 Many thanks to all those who attended the DHU2 Symposium at the University of Utah. Thanks to my co-director, Rebekah Cummings, as well as many others, we had a stimulating couple of days of hearing about the work of scholars in Utah and the greater Mountain West region. Alan Liu was kind enough to serve as our keynote speaker, and I had the pleasure of introducing my former adviser to the audience. There were five of his former students in the auditorium that day, including me, which is a testament to the quality and rigor of his mentorship. Perry Collins of the NEH Office of Digital Humanities also gave a series of workshops and consultations regarding NEH’s portfolio of DH-related funding streams–it was incredibly useful and certainly got my mind racing about possible projects. I also have to mention that I was impressed with my graduate students from my Digital Humanities Seminar, English 6810, who all did excellent jobs of moderating panels and keeping things running smoothly. ← Illegal Literature has arrived (updated w/ reviews)!